Born in Toronto, Canada to a Portuguese father and a French-Canadian mother, Gomes began playing guitar in his early teens and was drawn to the blues sounds of B.B. King, Buddy Guy, Eric Clapton and Jimi Hendrix. While he honed his skills in the blues bars at night, Gomes earned a master’s degree from the University of Toronto focusing on the racial evolution of blues music. He relocated to Chicago in the late ’90s to learn from the blues masters. During his brief stint as a sideman for Magic Slim and the Teardrops, Gomes put together his own group and won the first annual Buddy Guy’s Legends “Best Unsigned Blues Band” competition in 1998. Later that year, Gomes released his debut CD, Blues in Technicolor, which introduced him as a guitar-slinger loaded with impressive firepower. On 2002’s Unity, he accomplished the album’s title with a heavy mix of styles leading Bandit Blues Radio to name it one of the Top 30 Essential Blues CDs of all time. Gomes was elevated to the top of the blues field just one year later when BluesWax Magazine named him “Artist of the Year,” an award he would claim for several years in a row due to his endless commitment and touring. Music Is the Medicine (2006) peaked at number four on the Billboard Top Blues Albums chart, only to be outdone by LIVE (2008) debuting at number one. Last year, Gomes received critical acclaim for his release of Up 2 Zero. The album claimed “Best Blues CD of 2012” (A1 Blues.com) and “Best Blues Rock CD of 2012” (Blues Underground Network). 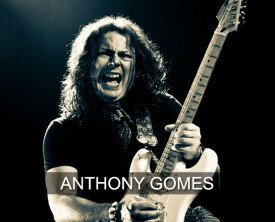 Art Tipaldi, Editor of Blues Revue, declared Gomes “at the forefront of modern blues.” Anthony recently climbed to the number one position on Reverbnation’s Global Blues Chart. “LIVE” (Ruf Records) debuted at number one on Billboard’s Top Blues Album Chart. The CD is the first number one Billboard Blues Album for both Gomes and Ruf. Nominated by BluesWax for Blues Artist of the Year four times, winning it once in 2003. Performed in 11 countries and throughout the United States including; France, Great Britain, Italy, Portugal, Switzerland, Norway, Belgium, Finland, Canada, Jamaica and Mexico. Complete Woman/Cosmopolitan Magazine named Gomes one of music’s most ‘Eligible Bachelors’ in their ‘Men of Music’ feature. Performed with BB King, Robert Plant, Doobie Brothers, Buddy Guy, Kenny Wayne Sheppard, Robert Cray, Chuck Berry, George Thorogood, Arc Angels, .38 Special, Eric Johnson, Gretchen Wilson, James Otto, Big and Rich, Cowboy Troy, Jim Peterik, John Goodman and Tim Robbins. Earned a Master’s Degree from the University of Toronto and wrote his Master’s Thesis on “The Racial Evolution of Blues Music”. Gomes graduated with high distinction and earned several academic scholarships and honors including the C.P. Stacey award. Has collaborated with songwriters Mark Selby (Dixie Chicks, Kenny Wayne Sheppard), Jim Peterik (.38 Special, Lynyrd Skynyrd, Sammy Hagar, Survivor), Bruce McCabe (Jonny Lang, Bonnie Raitt), Tom Hambridge (Susan Tedeschi, Buddy Guy) and Kelly Keagy (Night Ranger). Appeared in various national publications, including Blues Revue, Guitar Player, Vintage Guitar, Downbeat and Big City Blues. Currently endorses Gigliotti Guitars, Chicago Blues Box Amplifiers, Hammond/Leslie Amplifiers, TC Electronics, Dean Markley Stings, Seymour Duncan, RMC Effects, Xotic Effects, George L’s cables, and Wornstar Clothing. ​Won the first annual Buddy Guy’s Legends “Best Unsigned Blues Band” competition.